Apollo Horticulture is pleased to present a new wave of efficiency and stability to their line of Grow Lights by introducing the new T5 Grow Light System. Our T5 System is designed to compete with high intensity discharge bulbs in terms of light intensity and output. Efficiency: T5 Bulbs are small in diameter, but work as bright and efficient light sources. The average useable life span for these bulbs is well over 20,000 hours. Dependability: Man-made light sources experience some level of lumen depreciation over time. 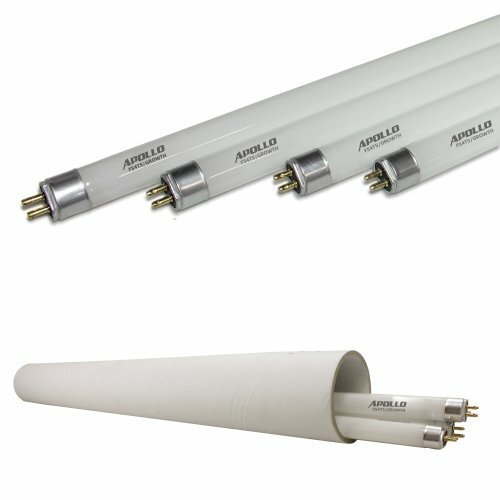 T5 Fluorescent bulbs will only depreciate between 8 and 10 percent of their rated lumen output throughout their lives. Cost-Effectiveness: Less wattage = lower cost. A key factor in switching to T5 lighting is its ability to not only produce better light, but also to do so while consuming far less energy. Superior Plant Health: T5 lamps promote incredible health and bloom of seedlings, cuttings, and produce enough light for full-term growth.